Unlike some traditional IoT applications, which typically feature endpoints equipped with sensors as the primary source of data collection, geospatial technology leverages GPS/GNSS location networks to collect data streams before transporting that data to be processed in the cloud. In units of time, we’re not far removed from the world of paper and ink. But if we measure the distance using terms of productivity, flexibility and value, today’s geospatial business environment is light-years away from its former location. We regard electronic data and communications as an essential for modern business. But these technologies are still young and growing. Not so long ago, typical project deliverables consisted of hardcopy drawings and reports. Even when using computer-aided data collection, processing and drafting, results often came as 2D drawings accompanied by written analyses. 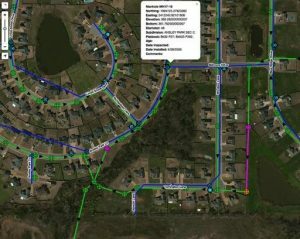 Over the years, clients and geospatial professionals recognized that the information contained in a 2D drawing could be put to work more quickly if it arrived as a computer file. As a result, many deliverables moved to electronic formats. CAD files, spreadsheets and reports have become the norm in most enterprises. Today many organizations employ information technology that enables stakeholders to easily share deliverables. Common data formats and visualization tools enable downstream users such as engineers, architects and planners to utilize the information. For example, in the days of hardcopy it would be unusual for a surveyor or engineer to develop a physical 3D model of a building site. If such a model were needed, architects would generally build it as part of the building’s design and approval process. By using modern instruments and software, geospatial professionals can create digital 3D models in a fraction of the time and cost. And instead of physically moving drawings and computer storage media, deliverables now arrive via 1990s technology: The internet. Using cloud-based systems for data collection and management, field and office teams can share common workflows across multiple platforms. The internet now plays a core function in the operation of most geospatial businesses. Organizations use the internet to communicate with their clients, contractors and employees via email, intranets and social media. Proposals can be delivered, contracts negotiated and results conveyed electronically, shortening up-front processes and producing tighter feedback loops. Cloud solutions build on the internet’s foundation of connectivity and interaction. In addition to moving information, remote servers can provide powerful computing capabilities. By tying handheld and desktop computers to cloud services, it’s possible to bring sophisticated data processing to more users and locations. 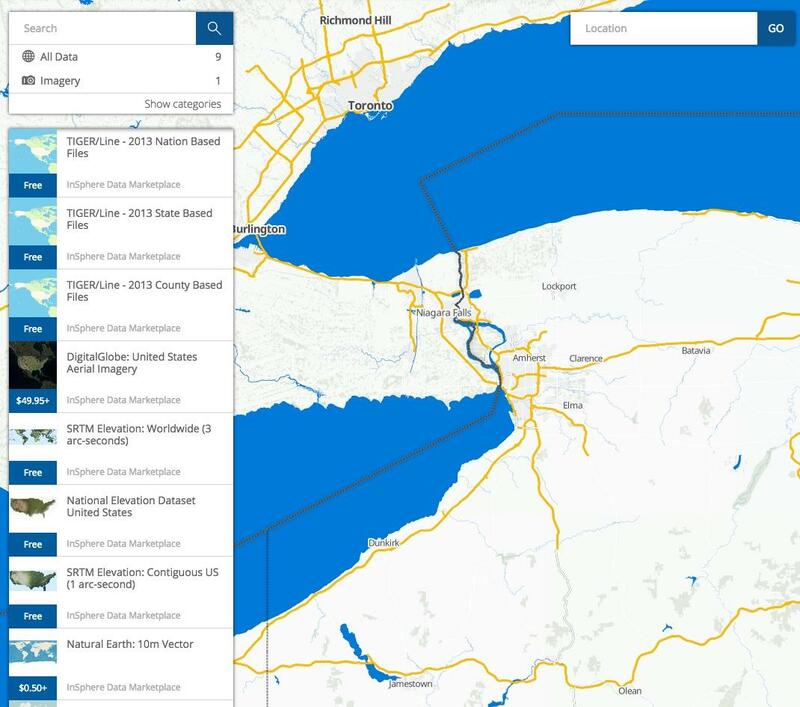 As a result, cloud-based systems for geospatial information management and analysis are poised to provide new flexibility in enterprise operations. Cloud-based access to utility information enables maintenance crews to quickly assess conditions in the field. While these trends have produced significant gains in productivity, the geospatial industry has yet to realize the full value of the cloud. Let’s look at some examples. 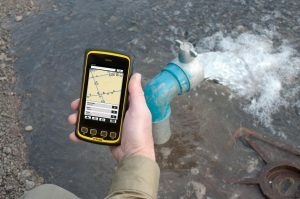 Many geospatial users gained their first experience with cloud solutions by using groups of interconnected global navigation satellite system (GNSS) receivers known as real-time GNSS networks (RTN). Using RTN, networks of GNSS reference stations streamed data to a powerful server where the information could be merged and analyzed. Then customized data streams could be sent to individual GNSS rovers for use in real-time kinematic positioning. Freed from the need for a reference station, surveyors could work quickly and freely over large geographic areas. The speed, ease and flexibility of the RTN technology helped fuel a dramatic increase in the use of real-time GNSS positioning. Today, cloud-based positioning services support applications in surveying and engineering, construction, agriculture and more. For example, structural or geotechnical monitoring solutions utilize cloud positioning and web interfaces to deliver critical real-time information to stakeholders in remote locations. There are now cloud-based platforms of software, data and services to serve the geospatial community. Focused on applications in surveying, engineering and GIS, the solution uses the cloud to support work in geospatial data management, field data collection and transfer, equipment management and spatial data catalogs. By combining cloud services with technologies for positioning, communications and data analysis, companies can leverage point-of-work delivery of information needed by geospatial professionals in the field and office. As an illustration, a surveyor typically needs multiple types of data to plan and execute a project. This includes previous surveys, government data, maps and other information. Some of the data may be held in the surveyor’s own records, while other information may come from government agencies and private suppliers such as DigitalGlobe or Intermap. There are now tool providers that enable the surveyor to quickly discover and use the geospatial information specific to the project. Rather than manually searching through multiple information sources and formats, users can streamline the most common and time-consuming pre-survey tasks. The surveyor can quickly find the pertinent information and download it to his desktop. On the job site, field crews can use cloud-based applications and hosting services to exchange information to simplify workflows and data management. Additional services include the ability to track and manage the location and status of field equipment, including warranty information, software and firmware. Software offerings now allow users to customize workflows to streamline data collection on multiple platforms including iOS, Android and Windows. The system can automatically sync field information from multiple crews to a central server. The accurate and feature-rich data that geospatial professionals collect can be very valuable for other purposes. The cloud offers an ideal platform for individuals and organizations to exchange or sell their data as they feel appropriate for their business. Data is the cornerstone of any geospatial workflow. By enabling professionals to easily discover, access and utilize different types of data, the cloud will soon become an essential part of the daily processes of data collection, processing, modeling and analysis.